As the 50th anniversary of the tragic Apollo 1 spacecraft fire approaches, an Ottawa entrepreneur is at Cape Canaveral to participate in memorial ceremonies and preview the opening of a new exhibit dedicated to the legacy of the lost astronauts. Cape Canaveral, FL – At precisely 6:31 PM EST on Friday, January 27, 2017 a gathering of surviving family members, military personnel, NASA representatives and invited guests will fall silent as they acknowledge the exact moment 50 years prior that three astronauts lost their lives during the flash fire which occurred during pre-flight tests at Cape Canaveral Air Force Station’s Launch Complex 34. An eerie coincidence of timing sees the anniversaries of NASA’a three greatest loss-of-life accidents all occurring within a brief 6-day period each year, on January 27 (Apollo One, 1967), January 28 (Challenger, STS-51-L, 1986) and February 1 (Columbia, STS-107, 2003). After each tragic incident, flight operations were grounded while review boards set about the onerous task of identifying as many contributing factors as possible, allowing NASA’s program, equipment, procedures and training to be revised and updated based on the lessons learned. It is in this area that the greatest value lies for future engineers and generations of space explorers, preventing the need to learn tough and possibly fatal lessons a second time. 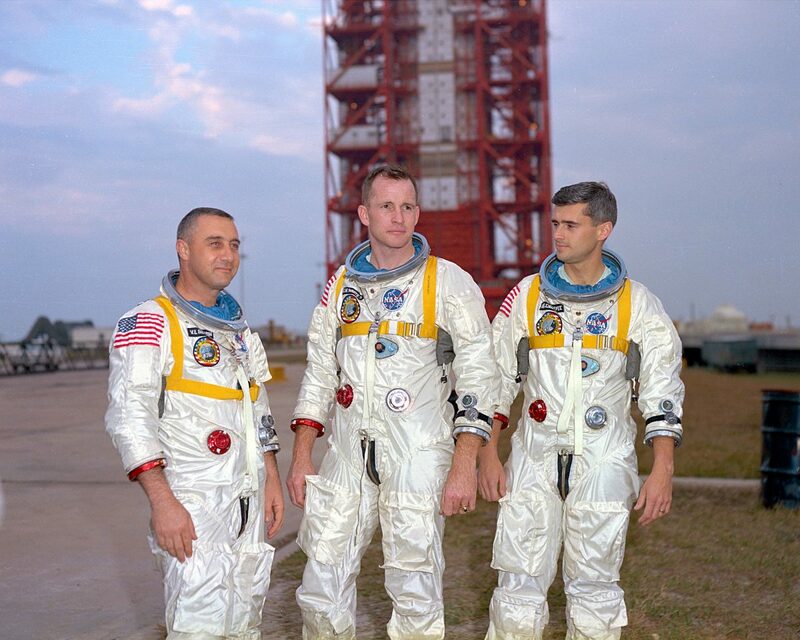 Activities focused on commemorating the 50th anniversary of the deaths of Gus Grissom, Ed White and Roger Chaffee include the opening of a new exhibit at the Kennedy Space Centre Visitor’s Centre (KSCVC) entitled, “Ad Astra Per Aspera. A Rough Road Leads to the Stars”, as well as an evening memorial service at the site of the accident itself, the remains of the test stand at Launch Complex 34. On Saturday January 28, the city of Titusville will also host a community ceremony to honour all fallen astronauts. Ottawa business owner and community volunteer Sean Costello will be present at each of these three ceremonies, meeting with members of the lost astronauts’ family, retired and current astronauts, space program workers and historians to continue his research, documentation and preservation of the full story and impact of these fateful events. Costello has been invited to participate in a preview tour of the sure-to-be-heart-wrenching exhibit on Friday morning and will be available after each of the ceremonies for telephone or Skype-style remote interviews for any outlets seeking to leverage his experiences and observations as part of their coverage. Costello is a multi-year volunteer with the Apollo One Memorial Foundation and is also a founding Advisory Board member for The Mars Generation (www.TheMarsGeneration.org), a non-profit youth organization which seeks to inform, inspire and engage the youth of today in the areas of STEAM (Science, Technology, Engineering, Arts and Math) education and career consideration. Leveraging years of research into the accomplishments and advancements of both the Canadian Space Agency’s and American/NASA programs, Costello regularly devotes time to translating his personally gathered stories of challenge, opportunity, hard work and perseverance into presentations and writings targeted at people of all ages. By volunteering as a webcast producer for SpaceFlightInsider.com, Costello helps thousands of viewers around the world stay up to date on the advancements and accomplishments in both the public and private sectors of today’s extra-terrestrial operations. Local to the Ottawa region, Costello presents to school-age children during science camps and has been welcomed on multiple local radio stations to share his experiences, observations and the inspiring stories of the legacies of those great women and men who have left the earth in search of new knowledge and awareness.